We know that team leaders are eager to equip themselves with skills and insights in a just-in-time manner. That's why we developed the foundations program, a series of one month modules on key team leadership topics, which are delivered in a virtual setting. Note that these programs can also be delivered in-house to your teams and groups. We also offer an on-demand learning option as well at the Teams365 Team Leader U - a series of short (2 plus hour) video based courses you can take at your own pace. Our first course - Teams365 Teamwork Foundations launched during summer 2016 (click to read more about this on-demand program). Each course consists of four hour calls over a month OR six weeks. Each module includes practical insights and tools for team leaders, along with a number of resource links. Participants are part of small group cohort with class size capped at 12. Each week, participate in virtual learning conversations. At present there are 8 modules in total, equipping you with a range of skills, enhanced awareness and resources you can go to for further learning. Download our Fall 2015 dates which also includes some Frequently Asked Questions about the program. You are invited to participate in all 8 courses as part of a larger cohort or take each one, one at a time. Programming can also be offered in-house to your own teams or groups or new teaders. View a 12 minute presentation about past Cohortshere. 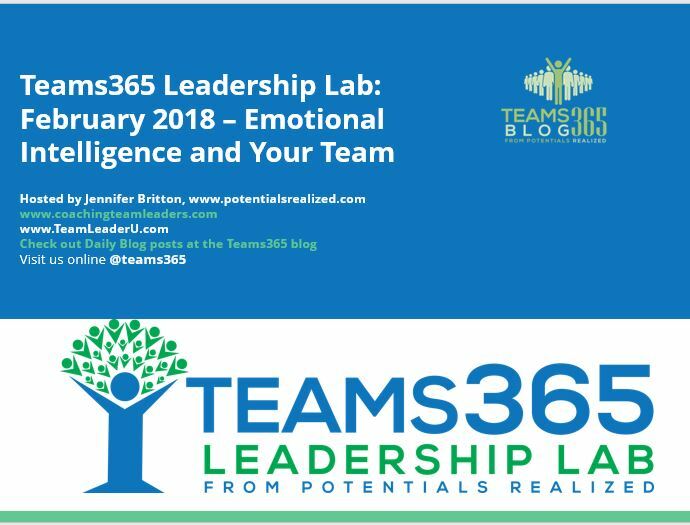 1. the release of more on-demand learning modules available at the Teams365 Team Leader Teachable site. You can access it here. Courses start at $97 US per person.On Demand Learning Modules run for 2 - 4 hours and courses are being added regularly. Each program includes several hours of video programs, worksheets, and reading lists. 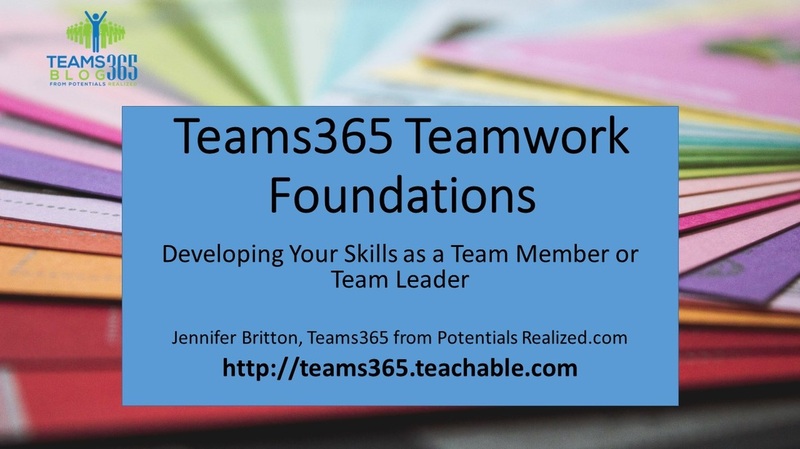 Teams365 Teamwork Foundations - Click here to register. 2. The Leadership Lab which will meet twice a month on Fridays for live calls (2nd and 4th week of the month). 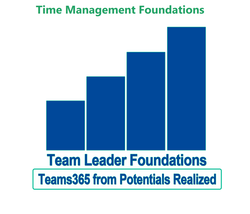 We also will continue to bring the Teams365 Foundations Live programs to organizations. These courses include 4-6 hour training programs which can be taken individually or in various combinations based on your needs. Virtual and in person delivery is possible. Take one, or take all of the courses! Can’t make the calls and want to do it individually? Contact Jennifer directly at (416)996-8326 to discuss. #1 - Stepping Into YOUR Leadership (6 modules): Learn more about this course here. #2: Team Leader Foundations (4 modules): Learn more about this course. #3 - Coaching Skills for Leaders (4 modules): Learn more about this course. #4: Time Management (4 Modules) Download a brochure about this course here. #5- Virtual Team Leadership Click here to download a brochure about this program. #6: Facilitation Skills Foundations Download a brochure about this course here. #7 - Relationship Building . Download a brochure about this program here. Can’t make every one of the calls? Calls are recorded and you can catch up to what you've missed in a module. You can also have this program brought into your organization, and/or work directly with Jennifer on it (pricing varies). Contact Jennifer to discuss your needs. 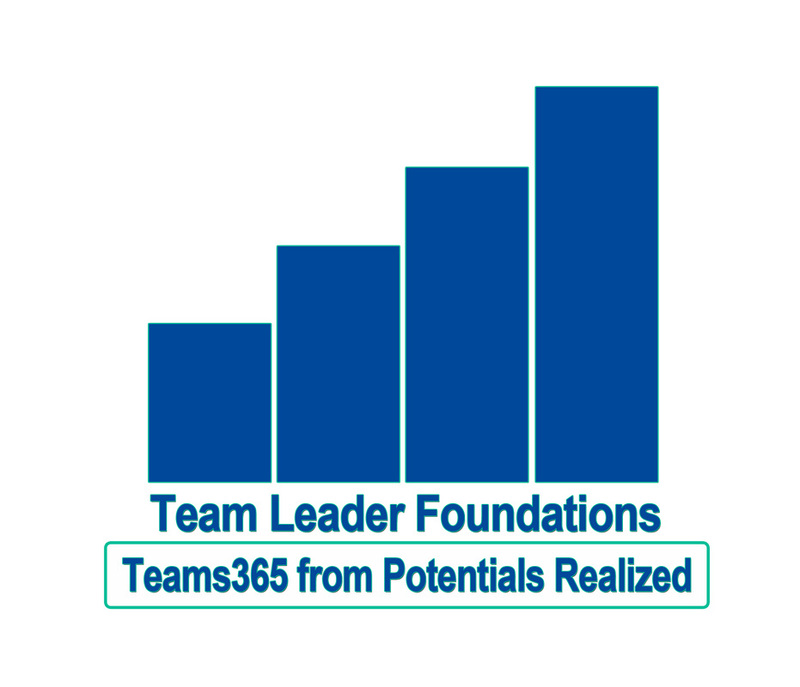 These foundational programs are in addition to the Teams365 Team Leader Coaching Group, a four month coaching experience for current, new and aspiring team leaders. Most modules will be offered two or three times a year. These programs can also be brought in-house to your organization. Questions? Contact Jennifer Britton directly at (416)996-8326 or email her. Team leaders are as strong as their core. This module explores your foundations as a leader and what you bring to your work every day. Consisting of six classes we explore foundational topics such as your vision, values, direction, strengths and style. This is one of the core Teams365 modules which feeds into other modules including Team Leadership, Coaching Skills for Leaders and Time Management. Exploring your style as a Leader. Using the Everything DiSC we will explore your unique style and how this impacts how you communicate, lead and support others. What is important to you as a leader? Your strengths make you unique. This module explores your top strengths. According to Gallup, people who use their strengths every day are six times more likely to be engaged on the job. Where are you going? What is your vision for your leadership? Research shows that as leaders grow, technical skills become less important, and interpersonal skills become more important. This module explores Emotional Intelligence - what is it, what skills it includes and what emotionally intelligent leaders do. The final class weaves together all that we have explored, and what you have learned, in this Foundations Module. The program also includes two one-on-one coaching calls (15 and 30 min) with the coach to discuss your own style as well as your participation in the program. This module connects with other modules such as Time Management Foundations where we explore delegation, and the Relationship Building Module which explores the topic of managing up. This program can also be customized for delivery at your organization. As part of your registration you receive the Everything DiSC(TM) Workplace profile and report, a Strengths-based assessment, weekly module notes and access to additional resources from the Teams365 Series. Cost: $525 US per person (public programming). In house programming can be delivered for your groups of 8- 12 persons. The team leadership role requires agility in terms of juggling multiple priorities. This program provides you with a better understanding of where your time is spent, what your priorities are, and some foundational tools to manage and organize your time. 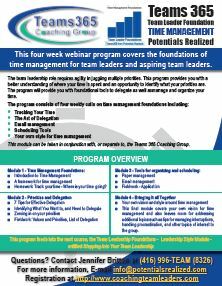 This is a four week virtual learning program which covers the foundations of time management for team leaders and aspiring team leaders. 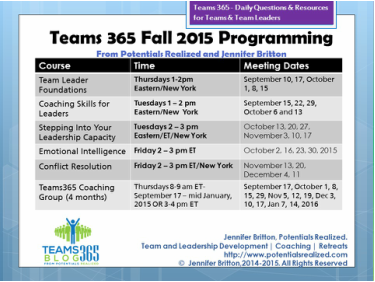 This course can be taken as part of, or separate to, the Teams 365 Leadership Lab and/or one of our Coaching Groups. A framework for time management. 7 Tips for Effective Delegation. Identifying What You Want to, and Need to Delegate. Zeroing in on your priorities. Getting your inbox in control - email management tips. Your own vision and style around time management.